First stop: the big square outside the opera house. I wanted a few pictures and we also needed to make a few adjustments to bike seat heights, helmet straps, etc. that we hadn't noticed at the bike shop. 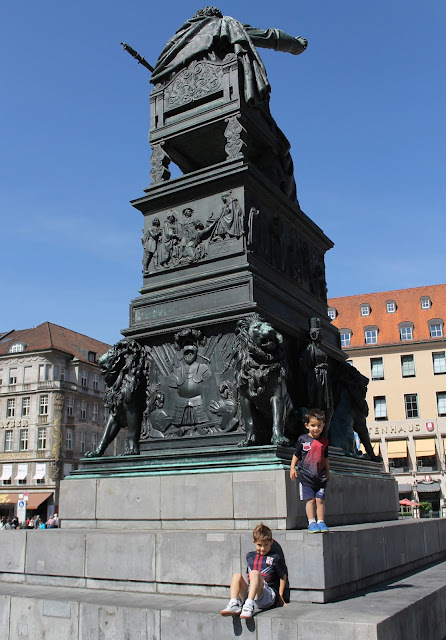 But the boys made themselves at home, as they always do, treating the statue in the middle of the square as a personal playground. Next stop: Olympic Park. This was one of the reasons we wanted to rent bikes, as its too far out of the city centre to easily walk to, at least from where we were staying. Yet it was gorgeous and lots of fun for the kids. 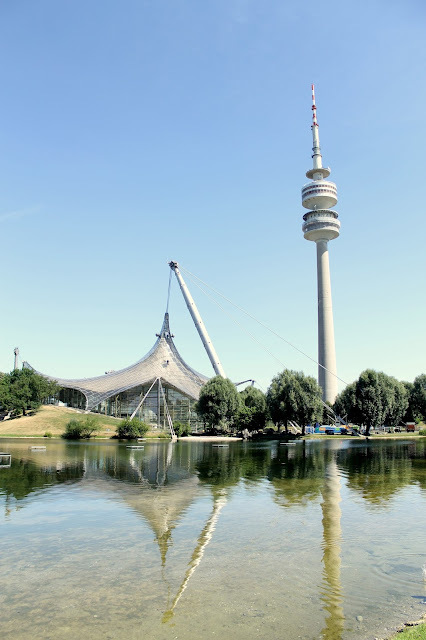 If you wanted to spend more time here, you can tour some of the Olympic venues, but we really just wanted to enjoy the big open spaces for playing and having a snack. 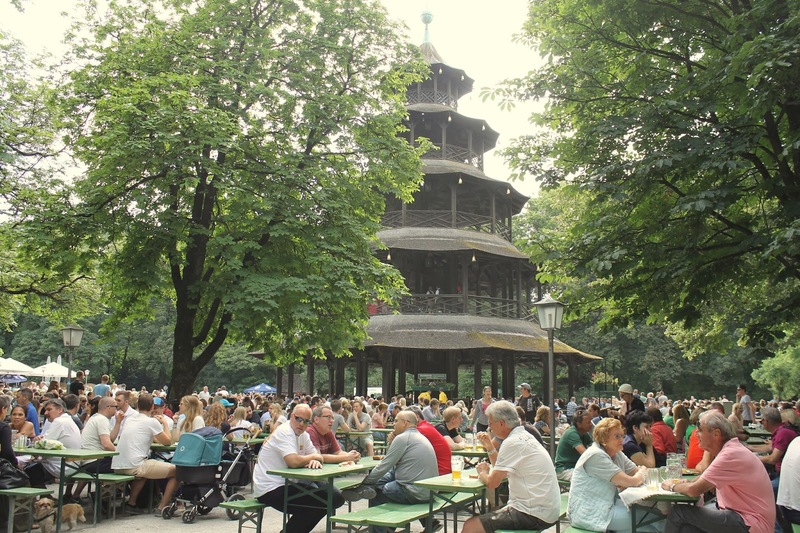 Next stop: Munich's famous English Gardens, and more specifically, the beer gardens found within. Out first beer garden was Hirschau. 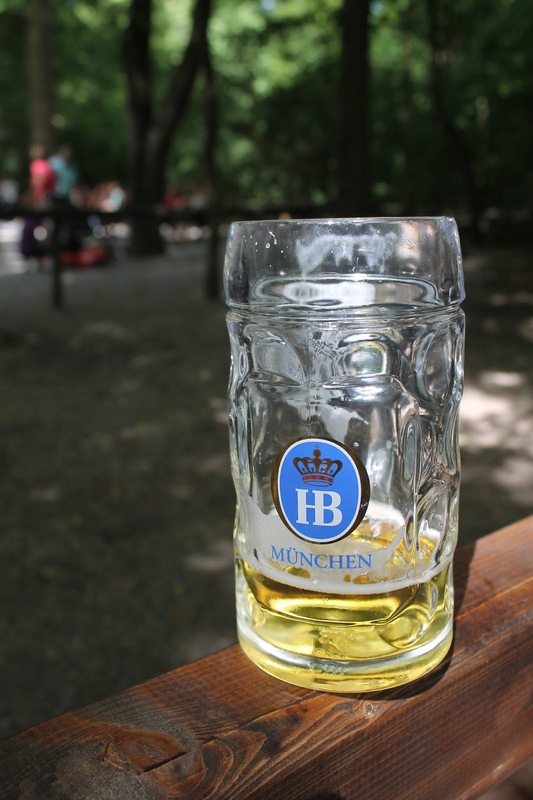 At Hirschau, we quickly realized these large beer gardens were awesome for families (buffet-style food service, live music, and most importantly: playgrounds!) We decided to spend the rest of that sunny afternoon visiting several beer gardens throughout the English Gardens. Next stop: Seehaus. This was probably my least favorite beer garden of the day (though that's like saying whipped cream is my least favorite ice cream topping). The location is gorgeous (directly next to the large lake). 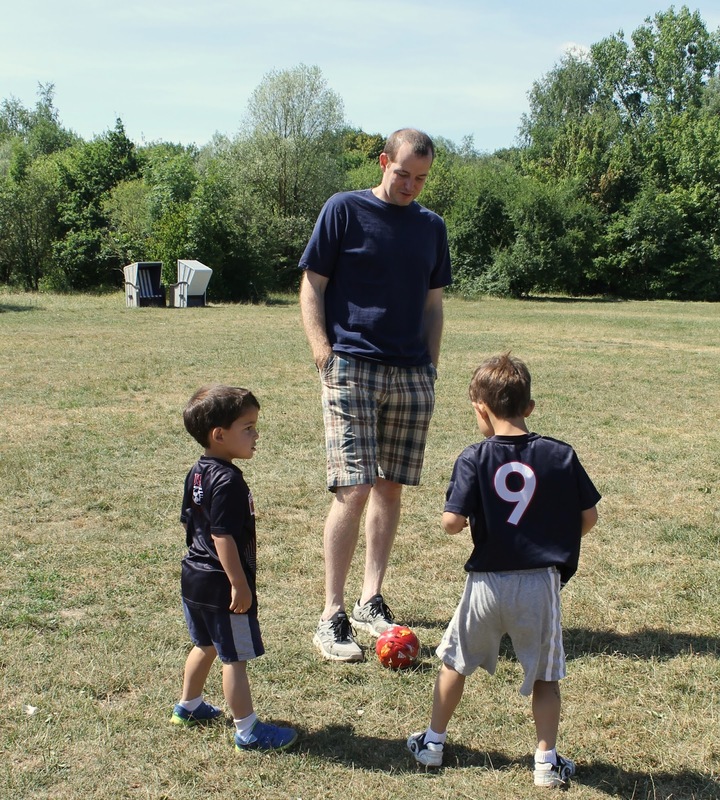 But the food and beers were more expensive here, and the playground was very small. Next stop: Chinesischer Turm. 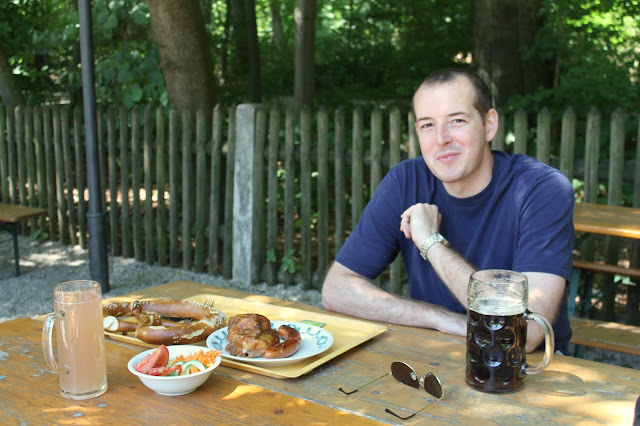 It was only fitting to spend one of our best family travel days at what turned out to be our favorite beer garden of the day. Big trees surround this spacious spot, so there was plenty of shade. The playground was large and fun, and the live band playing from one of the tiers in the pagoda gave it such a lively atmosphere. I could have spent the entire evening here, but alas, those bikes needed to be returned before the close of business. Final stop: Surfing! We finished our ride through the English Gardens with a stop at the surfing spot. 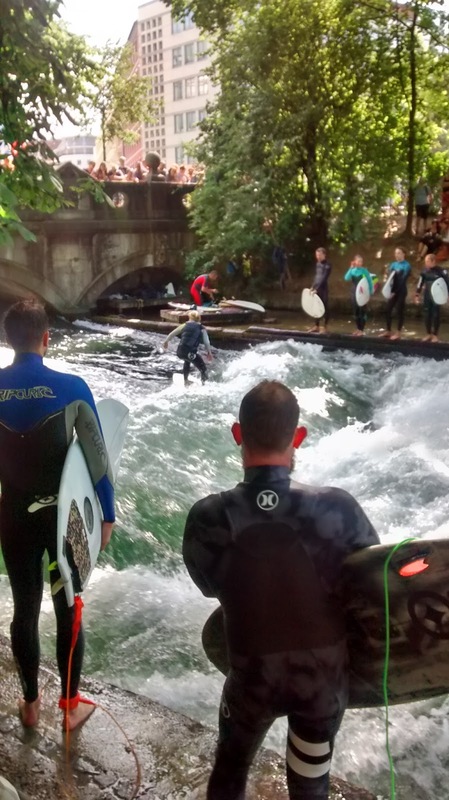 Yes, there's surfing in Munich! Rapids in an artificial stream that runs through the gardens have created a popular place for surfers to take turns riding the waves created. You know those days where you wish you could freeze time? 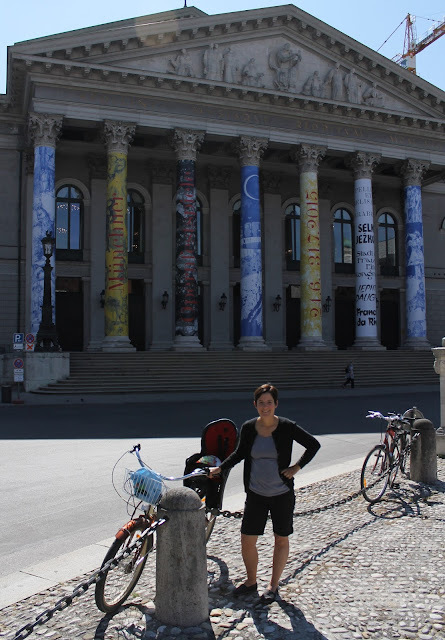 I'd happily hit the pause button on that day, whizzing through Munich on bikes, the giggles of my kids floating in the air.